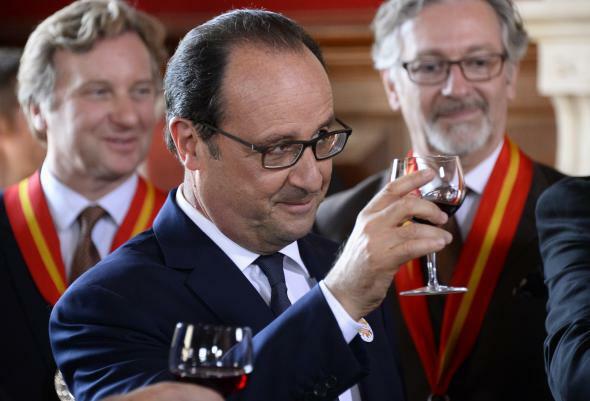 France and Iran quibble over wine halal menu before presidential visit. Rohani’s upcoming trip has already caused an uproar in France, where RTL radio reported on Monday that the Iranian president has refused to dine at the Elysée presidential palace if wine is served during the meal. Although Iran had requested a halal menu, which customarily means no alcohol, France was unwilling to break with the traditions surrounding official state lunches or dinners, according to RTL. The controversy has now threatened to overshadow Rohani’s visit, during which he is expected to discuss a number of issues with Hollande, including the nuclear deal as well as Syria’s conflict. “The French, RTL said, counter offered with a presumably alcohol-free breakfast—which the Iranians promptly rejected because it appeared too ‘cheap,’ ” according to the Washington Post. In fairness, France appears to draw a hard line when it comes to wine at the state dinner table, and it’s created a bit of diplomatic awkwardness in the past, with former Iraqi Prime Minister Nouri Al-Malik refusing a dinner invitation because alcohol was irrevocably on the menu.